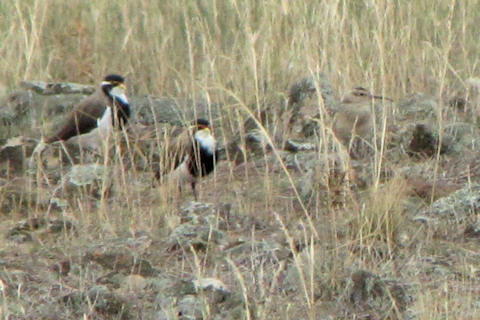 Smart move on the part of this Little Curlew, keeping company with a group of Banded Plovers (look carefully, he is there). If you don't want to be seen, blend in with the background next to birds that stand out like canine spherical objects. This Little Curlew was keeping company with a group of about ten Banded Lapwings and flew with them whenever they flew, which was whenever I got within sight. My thanks to Maarten Hulzebosch for reporting this bird on Birdline.